Alright, so there is no denying the fact that the DVDs are one of the best ways to store and share data between PCs. Now, we all know that in order to save any data on a DVD drive, we need to burn the data to the disc. Well, we can do so using any DVD Ripping or Burning software for Windows 10. A lot of users were requesting for a list of Best Free DVD Burning Softwares for Windows 10. So, we decided why not compile a list of 5 Free DVD Burning Softwares for Windows 10? Well, that’s exactly what this post is going to be all about. With that being said, let us jump right into it. Should we? If you go out on the Internet looking for some of the best DVD burning software for Windows PC, then the chances are that you would not be able to make a choice. Why? Well, this is simply because there are a lot of options to choose from. So here we are with our 5 Free DVD Burning Software for Windows 10. Please do note that none of these DVD burning Software are sponsors of this post. These are our unbiased picks and is not being influenced by any third party or individual. With that being clear, that being said, let us now take a look at the first DVD burning software on the list. Should we? Starting off the list of 5 Best Free DVD Burning Software for Windows 10, we have the BurnAware Free at number 1. Now, the BurnAware Free comes with a pretty simple and straightforward User Interface which is quite easy to operate on. There is nothing crazy going on, nor does it follow any modern UI Design. Anyways, with the BurnAware Free, the users can easily burn the data and media files like Music, Videos, and more on their DVDs. The software supports a huge variety of Discs including the CDs, DVDs, Blu-Ray media etc. During our testing, we didn’t face any issues with the Software. You should definitely check it out at least once on your Windows 10 PC. Continuing with the list of best DVD Burning Software for Windows 10 PC, we have the BurnAware Free coming in at number 2. We really liked the User Interface on this one. The UI is quite straightforward yet beautiful. Though the Software does not really follow any materialistic or minimal user interface, but, it is still very responsive and simple. The Software is completely free to download and install on any version of Windows including the Windows 10. You can easily burn any data to the disc including the music files like MP3, WAV, WMA and more. You can try it out if you are a fan of a simple yet responsive user interface. CD Burner XP is another great free DVD Burning Software for Windows 10 PCs. Now, one of the best things about the CD Burner XP is that it comes with multi language option. This means that if you are not compatible with the English language, then you can use the tool in your native language as well. The Software is compatible with all the major versions of the Windows from the Windows XP, 7, Vista all the way to the Windows 10. However, you can use the CD Burner XP to burn ISO Files only to your Disc. Anyways, the software is completely free to download and install. Burn4Free is another good option for those who are looking for a free DVD Burning Software for Windows 10. Now, the Burn4Free is highly customizable software. You can play around with options, change colours and basically personalize the software the way you like. You can burn the data to your disc pretty quick within a few clicks. There are a lot of ways to do so. The easiest one being, simply dragging and dropping the files which you want to burn to the disc into the software and start the process. The process does not take any longer, again it depends on the size of file and specifications of your Windows PC. The Burn4Free as the name suggests is completely free to download and use. 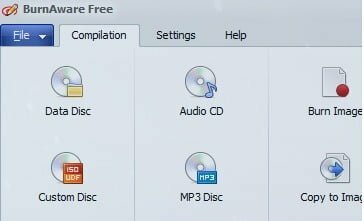 And finally the last, but certainly not the least, we have the Free Video to DVD Converter on our list of 5 Best Free DVD Burning Software for Windows 10 PC. As the name suggests, Free Video to DVD Converter is a free DVD Burning Software which can be used to burn the Video files to the Discs. The software supports most of the Video formats out there. You can easily burn Videos to your BluRay, CDs and DVDs as well. The Free Video to DVD Converter is completely free to download and to use on any PC running on Windows Operating System. So that’s it guys, this was our take on Top 5 Free DVD Burning Softwares for Windows 10. We hope that you found this post useful. Let us know what’s your pick for the best DVD Burning Software in the comments section down below.